Accusations of under-investment and charging exorbitant development duties to start-up companies and other enterprise projects were levelled against Tipperary County Council yesterday; as up to some five thousand citizens of all age groups, took part in a march through Tipperary Town, Co Tipperary, in protest at what was described as “years of solid neglect and lack of investment by various governments”. 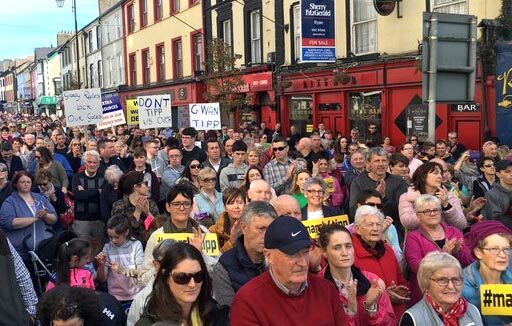 Organisers of the #march4tipp protest described their area as being an unemployment black spot with employment figures in excess of five times the national unemployment average. Some 22 businesses were recognised as having ‘shut shop’, in the town’s main thoroughfare in recent years. Organisers were particularly vocal in their criticism of Tipperary Co. Council; accusing them of investment failure and being anti-business with regards to their dealings, while making exorbitant development charges on companies and other enterprise start-ups. Against a backdrop of funding now being promised for the regeneration of Dublin’s inner city; educational institutions here in Tipperary town claim to be suffering from significant disadvantage, through not receiving DEIS (Delivering Equality of Opportunity in Schools) funding. Tipperary County Council reject these claims, stating Commercial Rates in the town are among the lowest within the State and further reiterate that it is fully committed to working together with businesses to develop the economic, social and tourism potential of Tipperary Town. Meanwhile, Fine Gael election hopefuls had conveniently vacated Tipperary Town for at least some of yesterday and were busy canvassing the housing estates of Thurles town, pushing election literature through unsuspecting letter boxes, in the faint hope of being granted substantial salaries; expenses, and into the future, that ever-lucrative State pension for their early retirement. Regrettably the Kilshane House, Co. Tipperary “free lunch”, hosted by the tax payers supporting Tipperary Co. Council and held back in early 2017, attended by over 200 guests from the Multi-National and Indigenous Sectors, Enterprise Ireland, the IDA, as well as high profile figures drawn from the world of Sport and Entertainment, not to mention the former Minister for Jobs, Enterprise and Innovation Mrs Mitchell O’Connor, failed to return even one single, miserable dividend. With Fine Gael in power, it is obvious that “Tipperary” is not being viewed as “The Place” or even “The Time”.